The holidays have arrived, and the credit cards are getting a workout. Sheldon Garon, author of “Beyond Our Means: Why America Spends While the World Saves” (November 2011), maintains that gift shopping isn’t only about giving – it’s our civic duty, we’re told. Q: The US savings rate plunged to about 0 percent in the last economic boom. Why? Garon: It happened because of the tremendous explosion of credit in the 1990s and early 2000s. It also had to do with skyrocketing housing prices from about 1995 to 2005. There is almost a one-to-one correspondence: The rise in home equity loans as a percentage of household income tracks the fall in the savings rate. It’s uncanny. This is sort of a class issue in the U.S. For middle-income to upper-income people, their “credit card” is a home equity line of credit. Lower-income individuals rely on credit cards, because rates of homeownership aren’t as high as you go down the income scale. Garon: The Chinese save at extraordinary rates, about 26%. But that’s something that happens with Asian economies just as they’re taking off. The Japanese and Korean economies did that too. The really interesting place is continental Europe, because it defies all the economic arguments. When economists study what affects savings rates, they say younger societies tend to save more because they have people in their peak earning years and relatively few retirees – that’s the life-cycle thesis. The economists’ argument made sense for rising Asian economies with a young labor force. 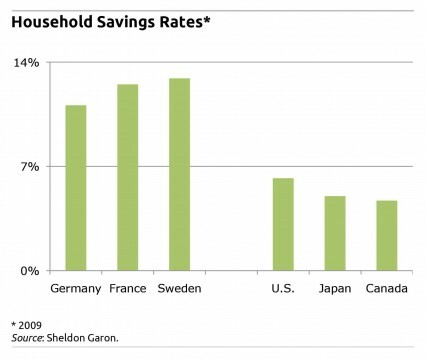 By that standard, the United States should be going down in its savings rates, because we’re an aging society. But the Europeans should be going down even farther, because they have more rapidly aging societies and very low birth rates. But the German, French, Austrian and Belgian savings rates are around 10 percent – Sweden has gone up to 13%. Economists clearly miscalled that one. They also believe national pension systems provide a disincentive to save: If I’m going to get my retirement from the government, and I’m going to get good benefits, then why should I save? Apparently, economists need to get out of the 5-star hotels they stay in and do more to understand why residents of European welfare states save a bundle. Q: Your book mentioned that institutional support historically for saving in other countries is missing in this country. What about behavior? Garon: We can never separate the behavioral and institutional. Some savings institutions have existed for 150 to 200 years now, and they have helped to form social and behavioral norms. When you walked into a savings bank in 19th-century Europe, Japan, or the U.S., you usually saw lots of signs and messages about the importance of saving. If you wanted to withdraw money, they’d sometimes ask you why you wanted to make the withdrawal and what you intended to spend the money on. Savings banks truly had a moral mission, and today in Europe and Japan you still see many policies that promote financial education and seek to persuade people to achieve a balance between saving and consumption. Q: So do US institutions encourage over-indebtedness? Garon: There really isn’t even an American word for “over-indebtedness” – the German word is Überschuldung, and surendettement is French. It’s not part of any government policy in the U.S. It’s not part of any law. And when I mention the word over-indebtedness to Americans, they usually look at me with a blank stare. If I were to ask an American economist, they probably would say, ‘How could we arbitrarily say that an individual is over-indebted?’ That’s a reasonable question but if you go to Europe, including the UK, there are explicit policies that legally define when someone is over-indebted. In Belgium, which a lot of this, if you miss even part of a house or credit-card payment for three months, you are by law defined as over-indebted. You’re reported to the central bank, which activates the welfare system and sends a social worker to straighten you out. Q: Why do Americans have so much debt? 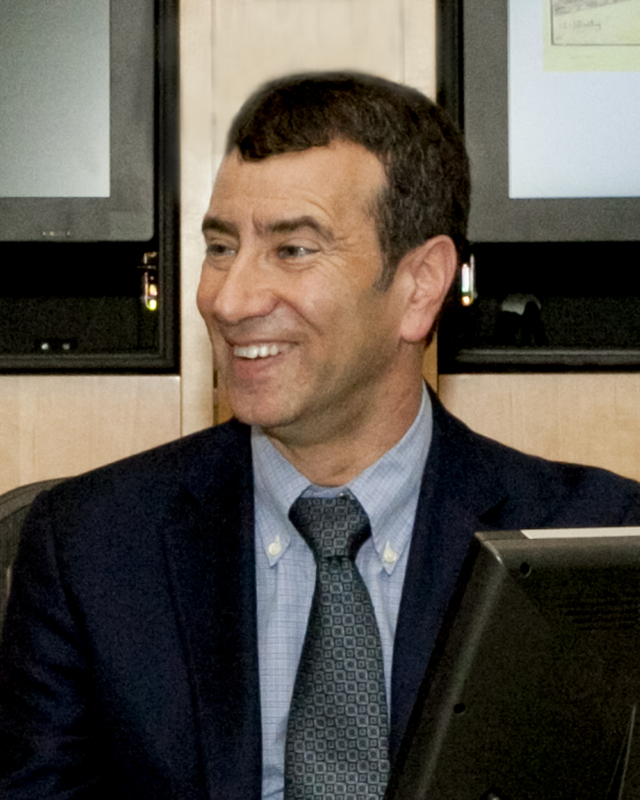 Garon: The democratization of credit has occurred since World War II or even the 1920s. From the 1920s to ‘50s, Americans loved to talk about the American standard of living, which was unquestionably the highest in the world. Americans of modest means, even in the 1920s, could buy cars on the installment plan or appliances – they could buy things Europeans and Japanese couldn’t even dream of buying because it would be so hard to save for them. A lot of businesses and progressive people thought this was pretty cool. Large numbers of Americans could live not just middle-class but affluent lifestyles. Q: What do you mean by America’s “democratization of credit”? Garon: In the 1950s, the major labor unions – AFL-CIO etc. – actually made it their highest priority to increase the purchasing power of the American worker. They could’ve asked for better working conditions or job security but they focused on the American worker as a consumer as their paramount goal. That’s an example of the democratization of credit. They believe American democracy thrived when everybody, despite their origins, was able to afford the American way of life. Q: How did we get away from more comfortable debt levels in the 1950s? Garon: It’s a question of, when was credit sustainable in America and when did it become unsustainable? We had impressive levels of income equality in the 50s and 60s that allowed people to very easily repay their debts. But the 1980s marked the turning point. For the lower income quintiles, wages began to stagnate or decline. Income inequality accelerates after 2001. According to Census data, fully 90 percent of American households have either seen their incomes stagnate or decline. Americans assumed record levels of debt at the very moment they were least able to repay. The financial industry happily extended an extraordinary amount of credit in the form of credit-card borrowing, home equity loans, and subprime mortgages. In Europe, when people get into trouble, they get social benefits from the state. In America, when people get into trouble, we give them more credit. Q: Lending has nearly dried up, so where are we now? Garon: Credit is drying up and to some extent that’s a good thing, because it sobers people up, and they realize they need to save up instead of borrowing. But this can’t be a matter just for individual households to decide. Clearly, we need more action by the government to shore up people who really have fallen off the cliff because of mortgages and other debts they can’t possibly repay. You can’t tell somebody who’s about to be foreclosed, if only you save your pennies you’ll be fine. Q: Do you ever feel like Scrooge? Garon: I’m waiting for Christmas to be over. The whole book is not about Christmas shopping though there is a page on it, because it’s so interesting. I spent a lot of my academic career outside of the United States, and there’s no phenomenon in the rest of the world like the American Christmas shopping season. While people may shop for gifts, nowhere else do people feel obligated to shop till they drop to help their economies, or feel like traitors if they don’t. The Christmas shopping ritual in America is a very unusual cultural construction. How appropriate! I attended a lecture two nights ago where the speaker ranted about how the commercialization and marketing of Christmas has taken the true spirit out of this holiday (holyday for Christians). The lecture was for the bereaved on grief in the holidays. Scrooge almost had it right. Bah! Humbug! to Christmas marketing but not to Christmas. Very timely interview. I hope it is read quite broadly. Credit, mortgages, and housing could benefit from adjustments based on market conditions, instead of government intervention.